A team of scientists has found and mapped the tallest tree on record in the tropics, standing at more than 100 meters (328 feet). 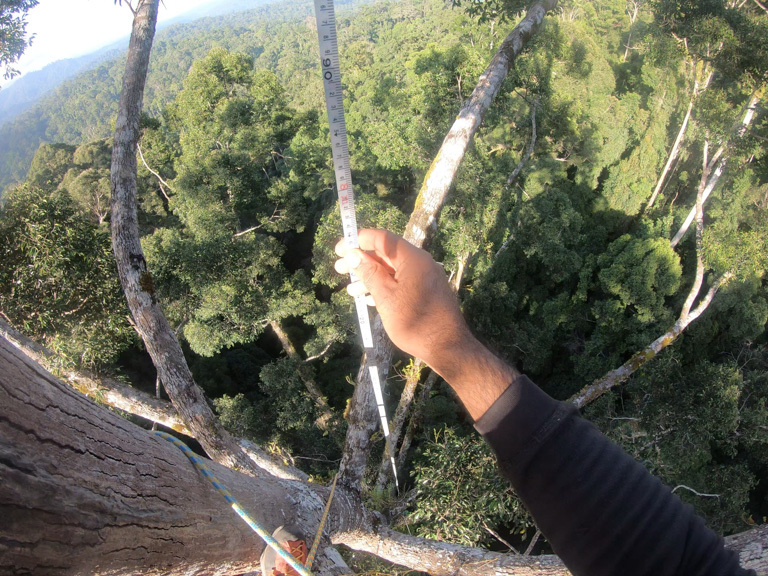 Climber Unding Jami with the South East Asia Rainforest Research Partnership scaled the tree and verified its height. The structure of the tree, determined from airborne lidar surveys as well as laser scans from the ground and drone photographs, provides insight into why these trees grow so high. There’s a new record for the tallest tree in the tropics, and the scientists who found it say it could add to our understanding of how and why some trees grow so tall. 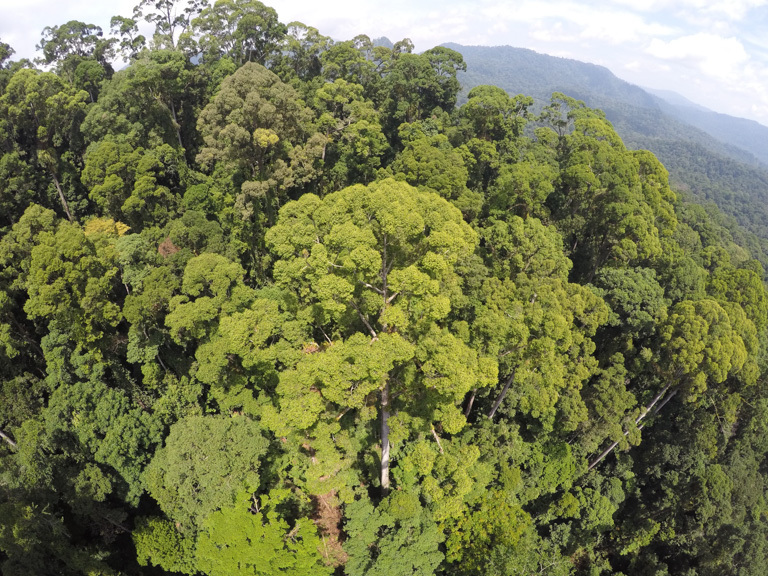 A survey from an airplane in 2014 of the forests of Danum Valley Conservation Area in Malaysian Borneo helped University of Nottingham geographer Doreen Boyd and her colleagues pick out the sky-scraping tree that they’re calling Menara, the Malay word for “tower.” But it wasn’t until Unding Jami, a local tree climber with the South East Asia Rainforest Research Partnership, or SEARPP, hoisted himself into the canopy of the yellow meranti (Shorea faguetiana) and lowered a measuring tape back to the ground that they were able to confirm the tree’s height at 100.8 meters (330.7 feet). Unding Jami high in the canopy. Image by Unding Jami. During that 2014 flight over Danum, the University of Nottingham team had pelted the forest canopy from above with laser pulses, a technology known as light detection and ranging, or lidar, to map out the 3D structure of the forest. This helped Boyd’s doctoral student, Chris Chandler, initially identify Menara in 2018. But the hilly terrain where the tree sits in the dense forests of Danum Valley can play tricks on lidar, potentially throwing off the estimate of its height. So several of the scientists hiked out to its location in August 2018, this time using a laser to scan the tree’s structure from the ground. They also snapped photographs of it from a drone. A drone photograph of Menara. Image by Alexander Shenkin. 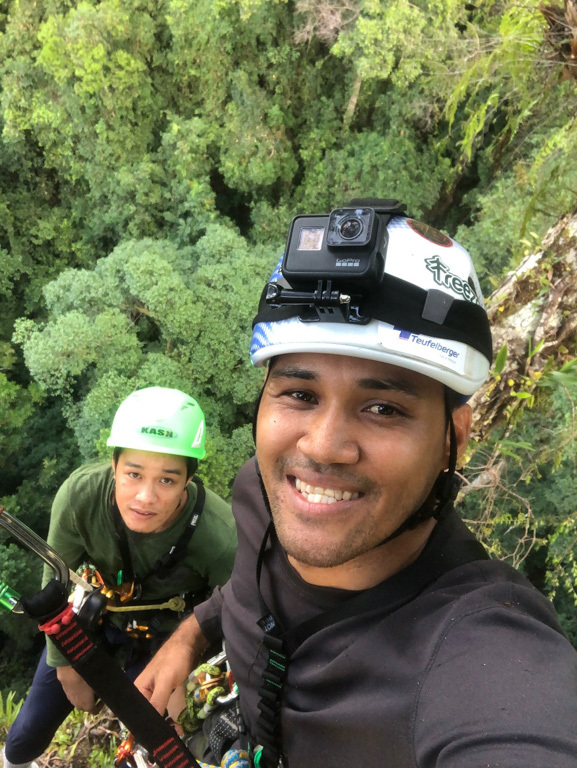 With the detailed picture of the tree, from the buttresses that fan out around its base up to the tuft of its canopy, the team began to puzzle out the mechanics of these tall trees and why so many are found in the Malaysian state of Sabah, home to the Danum Valley. They’ve included the details of their discovery, as well as their hypotheses, in a paper soon to be published in a scientific journal. “The jury is still out on what keeps trees from growing ever taller,” Alexander Shenkin, the paper’s lead author and a postdoctoral scholar at the University of Oxford, said in the statement. “Our analysis of the tree’s structure suggests that Menara is a long way from buckling under its own weight,” which the team calculated to be 81.5 metric tons (90 tons), or about as much as 13 African savanna elephants — not including the tree’s roots. They figure this type of tree could grow to 255 meters (837 feet) and still be able to support its bulk. However, Shenkin added, the winds that jostle the tree’s leafy canopy (and any daring climbers within it) could snap trees that grow even a few meters taller than Menara. It’s a delicate balance — one reason the meranti and other trees in the Dipterocarp family grow so tall is to spread their seeds on the breezes that blow through the canopy. 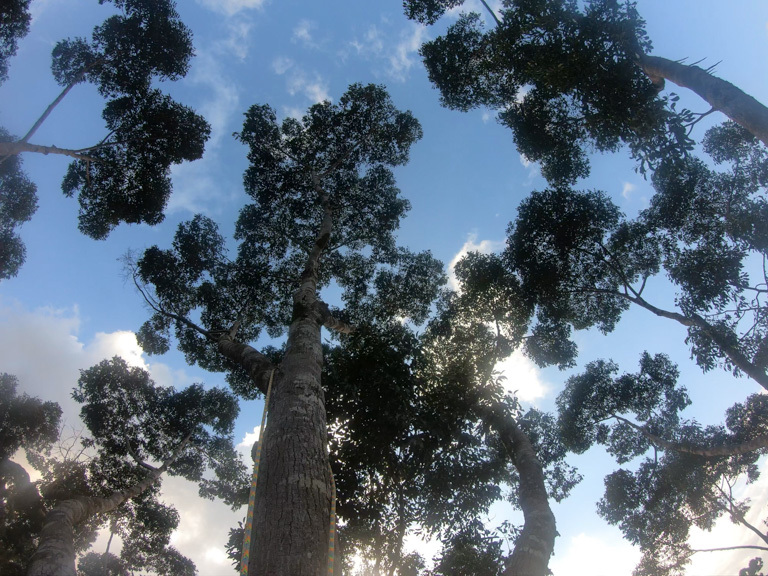 Danum Tall Tree – TLS + UAV data merged by Alexander Shenkin/University of Oxford on Sketchfab. It turns out that Sabah might provide just the right amount of wind. Sabah’s nickname is the land below (or beneath) the wind, Malhi said, and indeed, it lies outside the heavy winds of the typhoon belt that buffet its neighbors to the north. Also, unlike the Congo and Amazon rainforests, Sabah’s location on an island, rather than the interior of a continent, might also mean that the storms it’s subjected to aren’t as intense, Malhi added. Menara’s specific location, in a valley in the lee of a ridge, filters any strong winds that do blow through Sabah, and it probably has good access to water in the ground. Menara is a yellow meranti (Shorea faguetiana) that stands more than 100 meters (328 feet) tall. Image by Unding Jami. Scientists have announced a flurry of record-setting tree discoveries in recent years from the state of Sabah. In 2016, Unding made it to the top of another yellow meranti in the nearby Maliau Basin that was 89.5 meters (294 feet) tall. Just months later, a team led by Greg Asner, an ecologist and currently the director of the Center for Global Discovery and Conservation Science at Arizona State University, reported finding a 94.1-meter (309-foot) tree, also from the Shorea genus, along with 50 others that topped the 90-meter mark. Then, in July 2018, a Malaysian newspaper reported that officials in Sabah’s Tawau Hills Park said they had the tallest tree in the tropics — yet another yellow meranti that stands nearly 97 meters (318 feet) high. The density of these huge trees in Sabah also likely has something to do with the state’s focus on conservation, said Glen Reynolds, an ecologist and the director of SEARRP. “Over the past decade the Sabah Forestry Department has progressively extended the protection of several hundred thousand hectares of forest in the vicinity of the Danum Valley Conservation Area — which is now buffered on all sides by totally protected areas,” Reynolds said in the statement. The tape measure that confirmed the height of the tropic’s tallest recorded tree. Image by Unding Jami. Could a larger giant be tucked away in a tropical forest somewhere? It’s possible and even likely, Malhi said, though it probably won’t be much larger than Menara. The team’s modeling of potential wind speeds suggests that taller trees would be more liable to break in gusty conditions. And prior research indicates that the challenge of pumping carbohydrates produced in the canopy’s leaves down to the roots might also constrain how tall these types of trees can grow. “They’re right at their biological limits,” Malhi said. The race to find an even taller tree continues, however. On March 28, Asner tweeted that his team had found another tree, also in Danum Valley, that could be more than 100 meters (328 feet) tall. It’ll take another daring climb by someone like Unding to figure out if it stands high enough to push Menara into second place. Banner image of the record-setting tree from the ground by Unding Jami.